In a bowl whisk together the first 6 ingredients. Chop the chuck roast into cubes and toss in the flour mixture. Heat a large Dutch oven-style pot with some olive oil over medium-high heat and add some of the beef to sear on all sides for a few minutes. You may have to do this in batches. Transfer the meat to a plate. Using the same pot, add 2 Tbsp. olive oil and the diced onion. Cook for a few minutes and then add the mushrooms and eggplant. Cook until everything is well colored and starting to get soft. 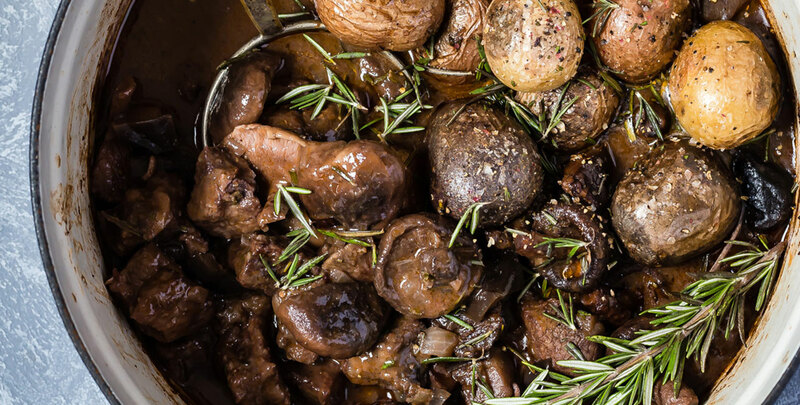 Add Holland House® Red Cooking Wine, red wine, broth, ketchup, Worcestershire, and rosemary and mix well. Add the meat to the pot, cover with a lid and place in the oven. Cook for 1½ hours and then check for tender meat. It should be soft when pressed with a fork. Cook for a further 30 minutes with the lid removed. Check for seasoning and add more if desired. Serve with roasted or mashed potatoes. Bold Boost #7: Add 2 Tbsp. of Holland House® White with Lemon Cooking Wine to your fish before grilling to get a flavorful finish.